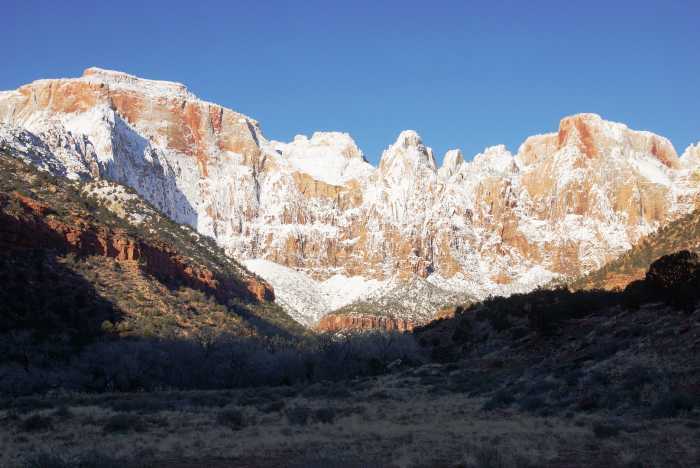 Want to watch the light from the rising sun sweep across one of Zion Canyon’s most impressive vistas? You can easily reach a good viewpoint, not far from Springdale, with no shuttle ride necessary. Just stop at the Zion Human History Museum and walk around back, for a panoramic view of the Temples and Towers of the Virgin. You can view the Temples and Towers of the Virgin behind the Zion Human History Museum, along Route 9, just north of the park entrance at Springdale. … then you can bet that the real thing is even better. The Temples and Towers of the Virgin are located at the end of a wide amphitheater behind the Human History Museum — the park’s former visitor center. During the winter months, the museum is closed, but you’ll still find some people stopping here, just for this view. In case you’re wondering exactly what you’re seeing — there are several notable peaks rising in front of you. On the left, the giant West Temple is the most notable feature. The Sundial is next to it, then the Towers of the Virgin, and over on the right is the Altar of Sacrifice. While the West Temple isn’t quite the highest point in Zion (that honor goes to Horse Ranch Mountain, north of the Kolob Canyons section of the park, at 8,726 feet), the West Temple does reach 7,810 feet, and it’s tall enough to be seen from some spots in St George. If the museum isn’t open, there isn’t much else to do here, aside from admiring the view of the Temples and Towers, and then moving on. 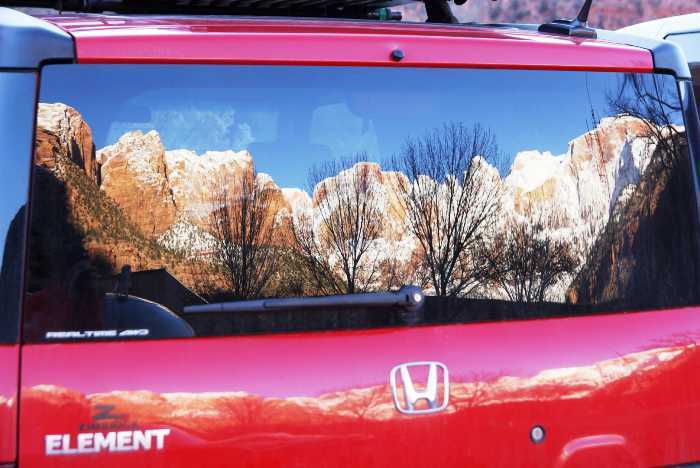 But, it’s still a great place to stop and enjoy a classic Zion view. And, if you check it out early in the morning, you can catch a beautiful sunrise.